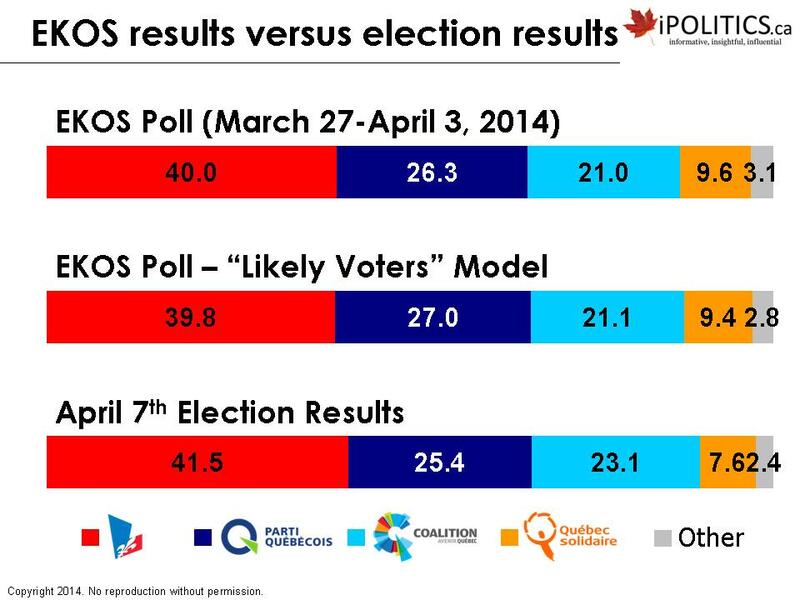 [Ottawa – April 8, 2014] After an exciting month-long campaign, the 41st Quebec general election has come to a close and we at EKOS are pleased that we accurately projected Philippe Couillard’s victory on Monday. Indeed, we succeeded in capturing all four major parties – the Quebec Liberals, the Parti Québécois, the Coalition Avenir Québec, and Québec Solidaire – to within the margin of error of yesterday’s election outcome. We also succeeded in noting the overall stability of the campaign. While we compiled our poll results three full days before Election Day (a veritable eternity by election campaign standards), the day-to-day results were largely stable. There were no signs of any last-minute shifts and it appeared that the vast majority of respondents had made up their minds well before election day. The exact dynamics of how the popular vote translates into seats are complex and given our deadlines and the relatively small sample sizes on a region-to-region basis, we opted not to provide an official seat projection, stating simply that the Quebec Liberals were within reach of a majority. We did, however, offer a “wild guess” estimate of 73 seats for the Quebec Liberals over Twitter, just three seats off from their 70-seat haul. In our pre-election poll, we provided a “likely voters” model to offer insights into the vote intention of those who are most likely to show up at the ballot booth come election day. 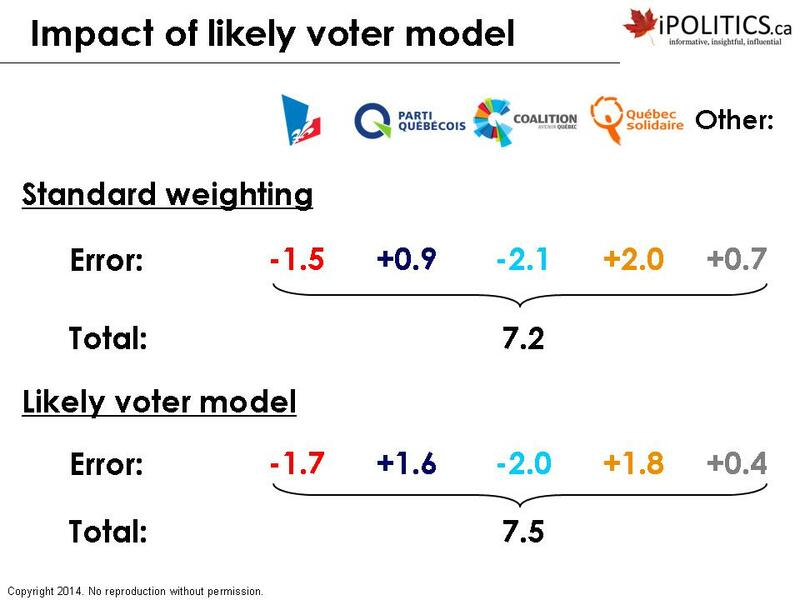 This model involved dropping “serial” non-voters (i.e., those respondents who told us that they did not vote in either the 2012 Quebec election or the 2011 federal election) and then weighting the remaining results to the demographics of those who voted in 2012. For example, youth (i.e., those ages 18-24) make up approximately 11 per cent of Quebec’s adult population but, due to their (somewhat) lower propensity to vote, they made up only nine per cent of electors in 2012 and they were weighted down accordingly. In the 2012 Quebec election, however, turnout rates were fairly consistent across all age groups. Indeed, turnout among those ages 18-24 was estimated at 62 per cent (not too far off from the overall turnout rate of 75 per cent). Similarly, there was almost no difference between the turnout rates for women and men (76 per cent and 73 per cent, respectively). For this reason, weighting by the demographic composition of those who voted in 2012 had only a trivial impact. Because of the near parity of the two weighting schemes, it is difficult to assess the effectiveness of our likely voters model. As a side note, however, we would like to stress the similarity between the two models is a reflection of the even distribution of participation across age groups. Indeed, the high levels of youth engagement in Quebec is an achievement to be envied by the rest of Canada, where youth turnout has been, quite frankly, abysmal in recent years. The real test for this model will come in an election where there are huge turnout gaps across age groups (federal election anyone?). In closing, we would like to thank the 1,400+ Quebeckers who generously took the time to respond to our survey. We applaud all of those who ran and congratulate the victors.